To be able to halt the tuberculosis (TB) epidemic, one of the first and most essential breakthroughs we need to realize is universal access to laboratories that provide quality-assured diagnostic tests for TB. Each year an estimated 3 million people are either not diagnosed or not treated for TB. To be able to identify all persons with TB disease in need of treatment, laboratory facilities and laboratory networks urgently need to be upgraded and expanded in many countries. Laboratory work is also becoming progressively complex, following the increased use of quality-assured diagnostics and the introduction of new laboratory tools. Countries often lack appropriately qualified technicians and well-trained managers, and laboratory services are facing challenges ranging from poor infrastructure, unreliable basic utilities (water, electricity), to interruptions of essential supplies. There is also an urgent need for better access to diagnostic tests for TB and multidrug-TB that are accurate, cheap, fast to use, require minimum training and simple infrastructure. New technologies that fit these requirements have become available in recent years (such as GeneXpert, see below), and they are now ready to be widely disseminated. To meet these needs, KNCV Tuberculosis Foundation is undertaking an ambitious plan to expand and upgrade laboratory services. We provide broad technical assistance, as always in close collaboration with our local and international partners, to strengthen laboratories and laboratory networks. Linkages: KNCV’s consultants are working to create linkages between the multiple players and disciplines in the TB diagnostic process. This includes education and communication with patients, human resource development, policy development, clinical algorithms, strategic planning and laboratory quality management. Standardization and quality: KNCV’s technical support includes helping countries to conduct assessments and develop a National TB Laboratory Strategic Plan. A country needs a TB-specific laboratory strategic plan to help determine what laboratory interventions are required for the next five years. KNCV also supports laboratories in obtaining ISO accreditation. With KNCV support Botswana’s National TB Reference Laboratory has successfully attained the first ISO 15189 accreditation of a National TB Reference Laboratory in Sub-Saharan Africa. Private-public mix: Laboratories in the private health sector are often poorly regulated, without external quality controls. 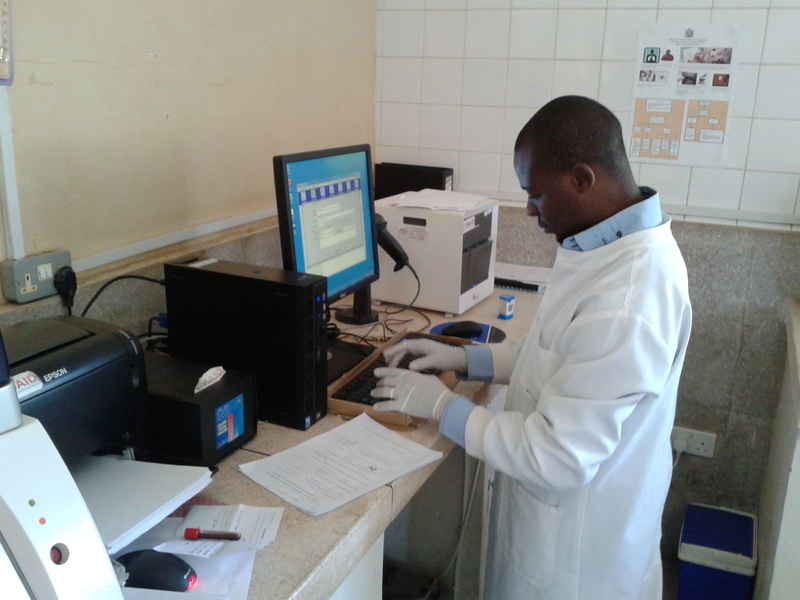 KNCV supports National TB control Programs in their engagement with private laboratories, and encourages the laboratories to perform tests in line with national guidelines and to participate in external quality assurance programs. GeneXpert: Since the WHO endorsed GeneXpert MTB/RIF testing in 2010 KNCV has been heavily involved in the implementation and scale-up of the diagnostic test in many countries, including Indonesia, Vietnam, Cambodia, Kenya, Botswana, Ethiopia, Nigeria, Zimbabwe, Kazakhstan, Kyrgyzstan and Tajikistan. As a result, the number of patients diagnosed with rifampicin resistance (and confirmed as having MDR-TB) has grown rapidly, saving many lives because treatment could be started more quickly, and preventing further transmission of the disease through adequate MDR-TB treatment. We are also supporting the use of GeneXpert for diagnosing TB among Persons Living with HIV (PLHIV) and among children, as well as promoting the use of the test to screen key populations, including prisoners and healthcare workers. In addition, KNCV has supported the use of other diagnostics, including liquid media culture and line probe assays for more rapid and accurate detection of MDR-TB. Technical Assistance: Our technical support to countries includes the development of national diagnostic guidelines, standard operating procedure registers, training curricula, and other tools for the implementation of new diagnostics. KNCV also advises laboratory networks on the adoption and expansion of new diagnostic technologies (LED-FM, GeneXpert, liquid culture) and conducts evaluation of the utility, feasibility and cost-effectiveness of these diagnostic tests in day-to-day patient care. Fundraising for resources to develop vital diagnostic capacity, including well-equipped laboratories, adequately trained staff, and appropriate coordination. 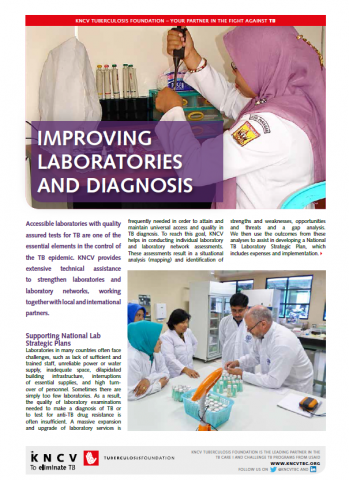 Our brochure “Improving laboratories and diagnosis"